Dimensions: 7" square x 1 1/2" (gift-box); Plate: 6 1/2" diameter. 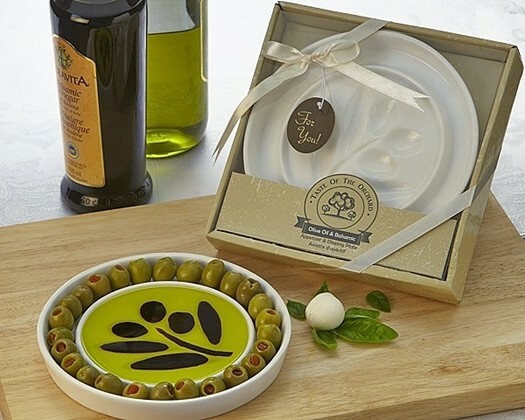 An original creation by Artisano Designs, this artfully-crafted olive oil and balsamic vinegar dipping dish is framed by an indented ring for adding your favorite appetizers, such as olives, cherry tomatoes or mozzarella cheese (don't forget the basil!). A perfect wedding favor or hostess gift, you'll want a few for your own entertaining! Each high-quality porcelain dish features a recessed olive branch motif for holding balsamic vinegar which rests under the olive oil layer (for best presentation results, pour olive oil first followed by balsamic vinegar into the recess). Each comes packaged in an olive orchard-themed display gift-box with rustic Tuscan-inspired detail, finished with a white satin bow and coordinating olive-shaped "For You" hanging tag.